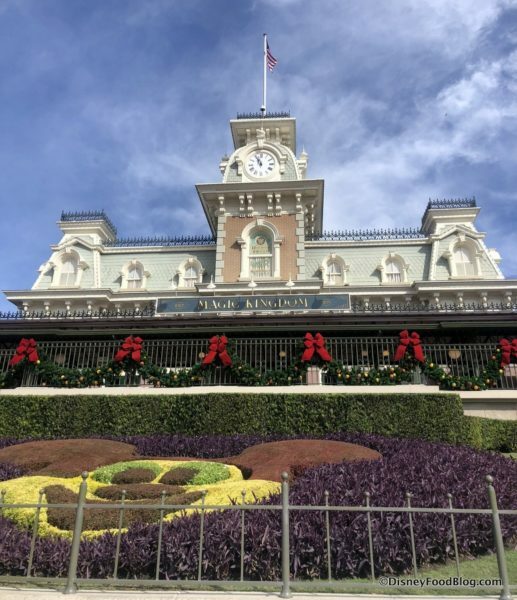 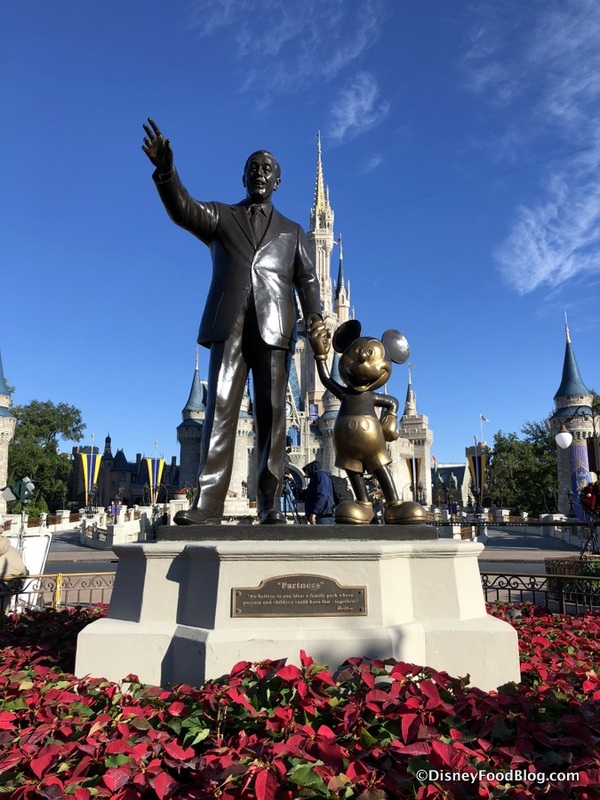 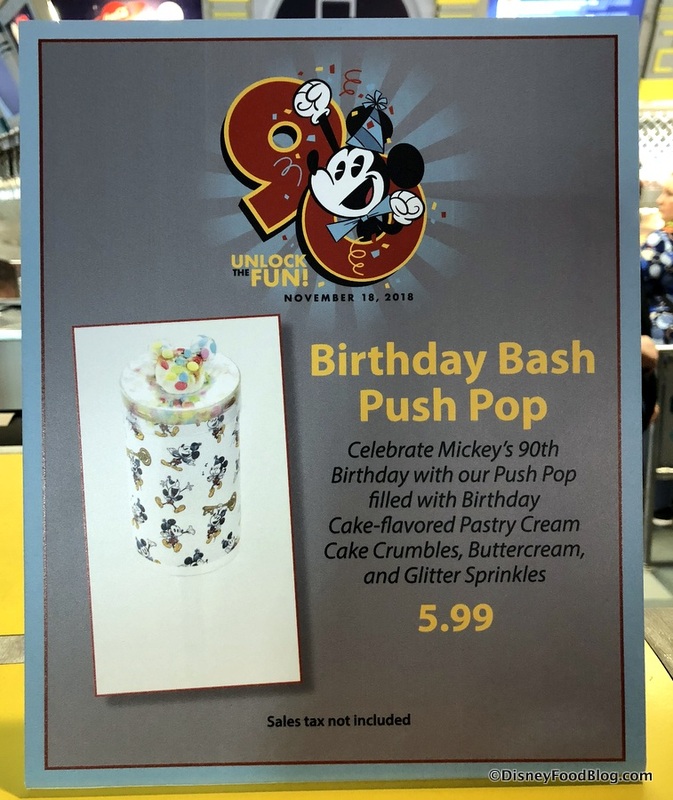 And today through Mickey’s official 90th Anniversary on November 18, 2018, we’re celebrating the Birthday Mouse all over Walt Disney World! 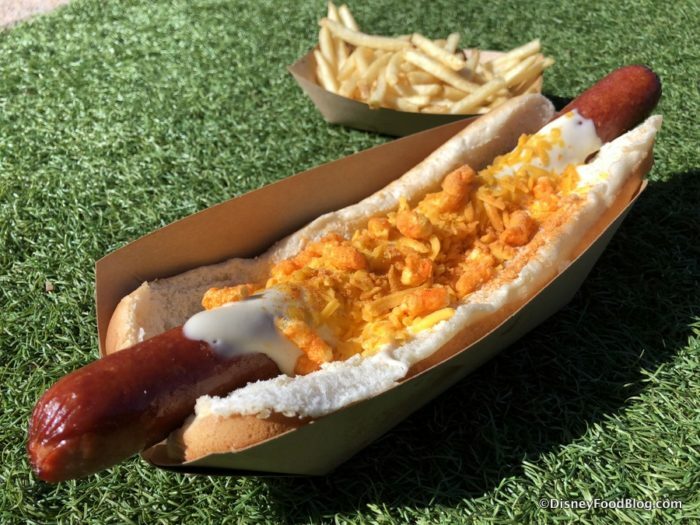 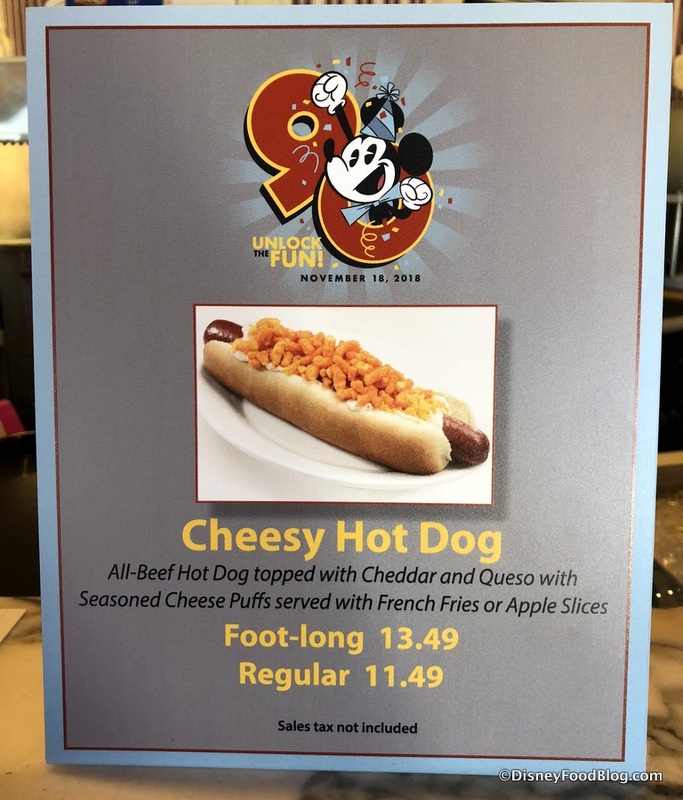 Magic Kingdom is pulling out all the stops with specialty limited time snacks which will be available through Sunday, November 18th. 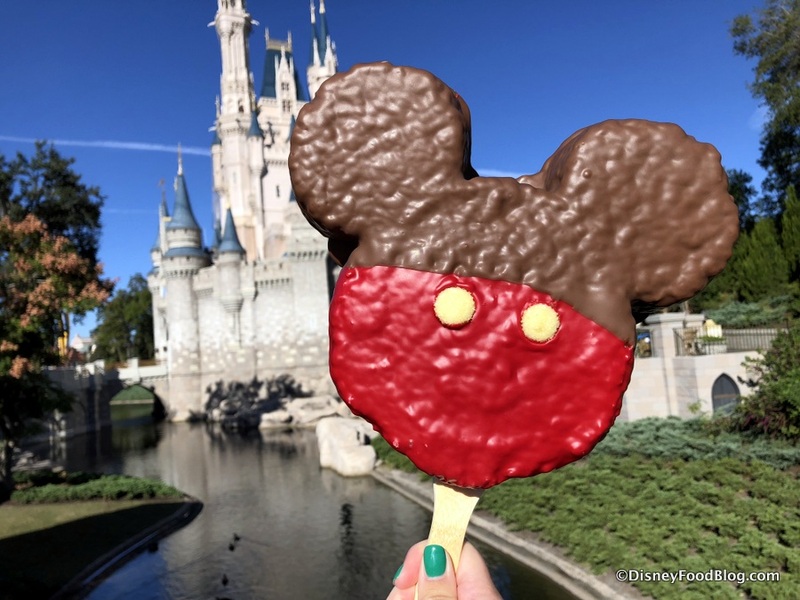 You can see the specialty snacks available at all the Walt Disney World Parks, Resorts, Disney Springs, and beyond here! 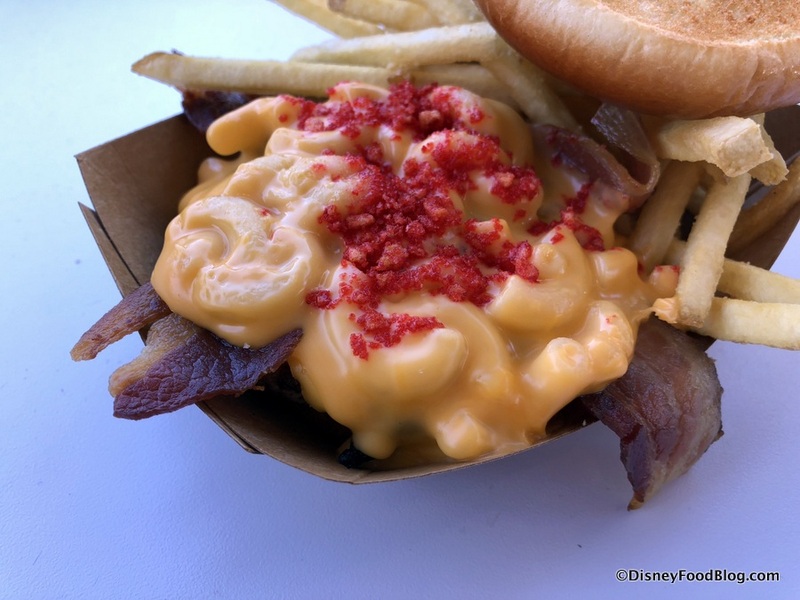 But for now, we’re checking out the Magic Kingdom eats, where the Party is in full swing! 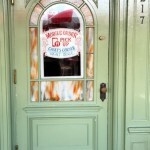 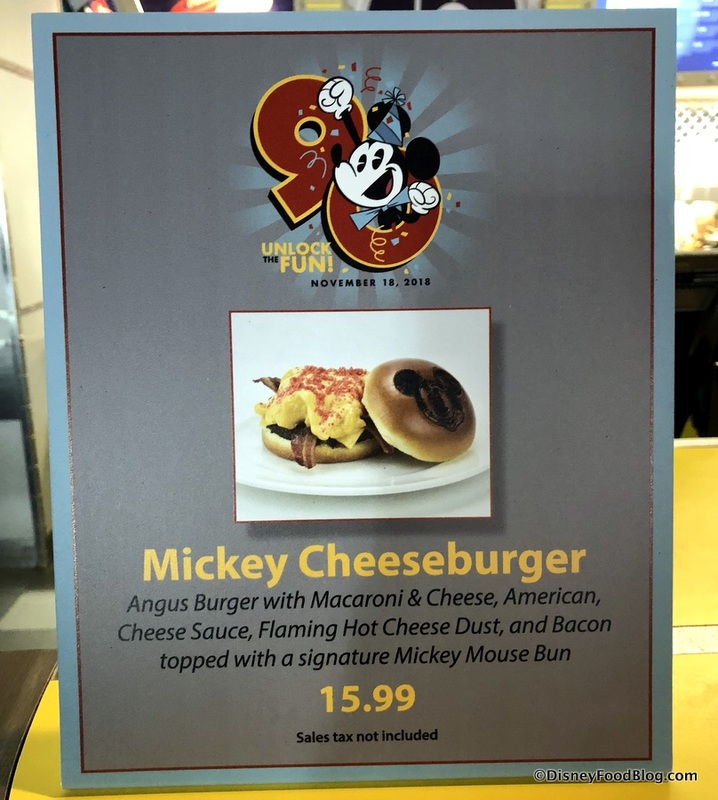 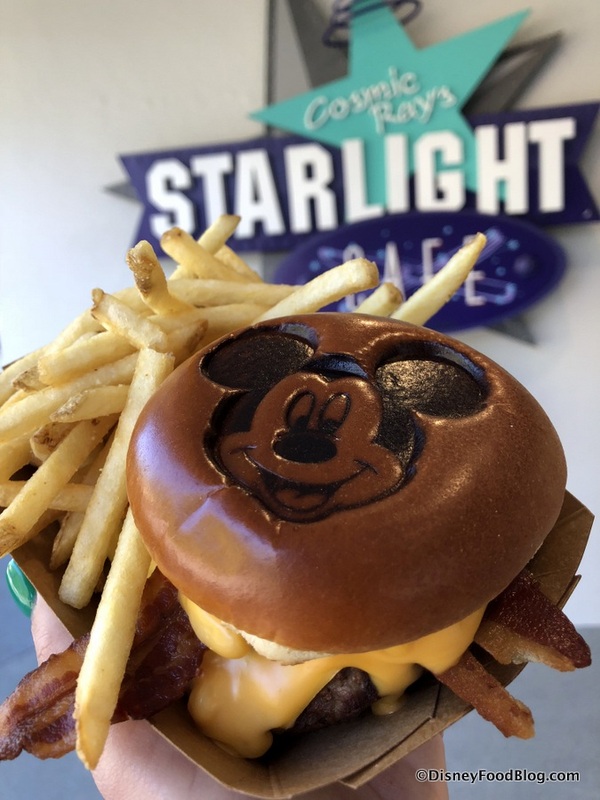 In Tomorrowland, Cosmic Ray’s Starlight Cafe is serving a Mickey Cheeseburger to mark the occasion! This burger is topped with various versions of Mickey’s favorite food: CHEESE!! 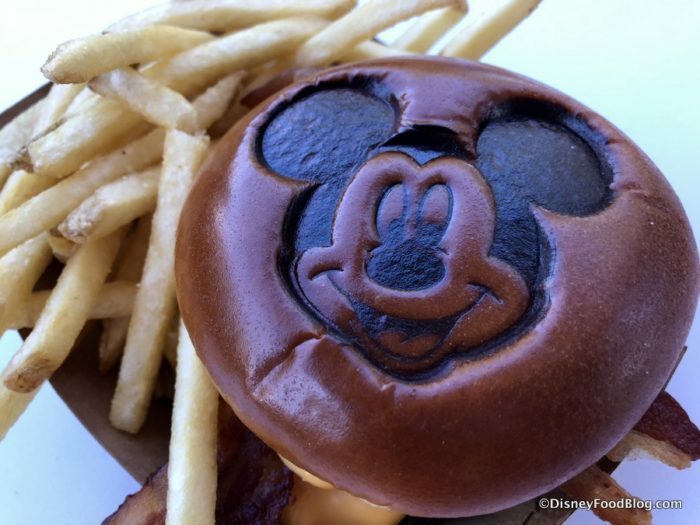 … all on the cutest Mickey Mouse Bun you ever did see!! 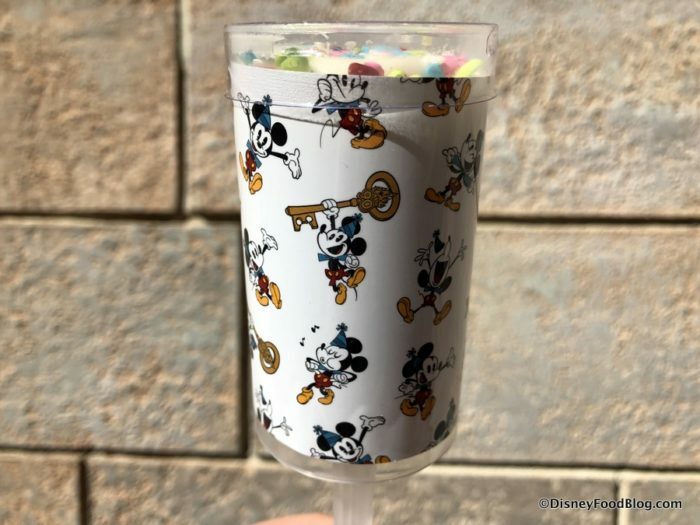 You’ll find the Birthday Bash Push Pop at Cosmic Ray’s Starlight Café, Pinocchio Village Haus, Pecos Bill Tall Tale Inn & Café, and Columbia Harbour House. 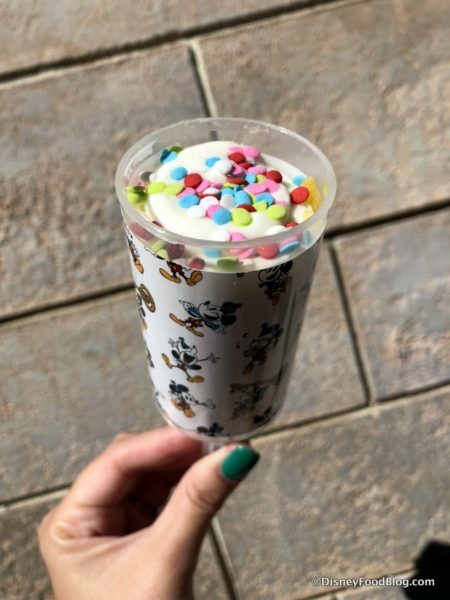 It’s filled with birthday cake pastry cream and made with layers of cake crumbles, buttercream, and glitter sprinkles. 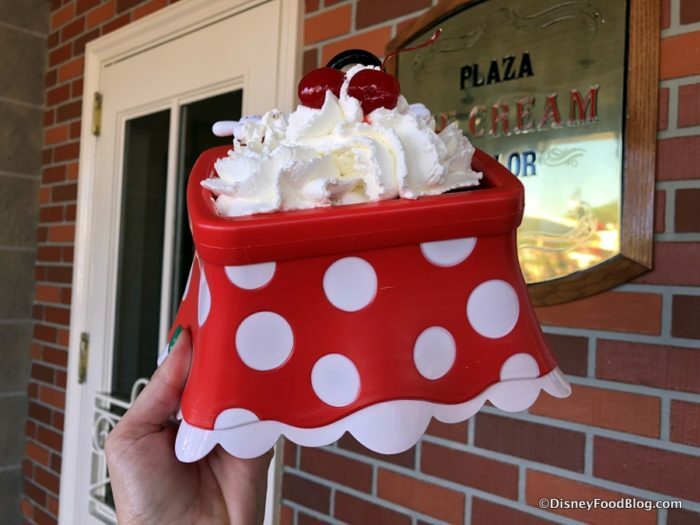 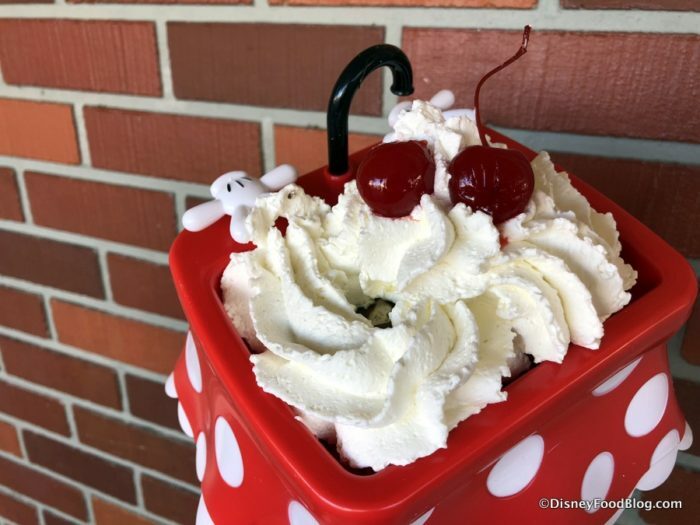 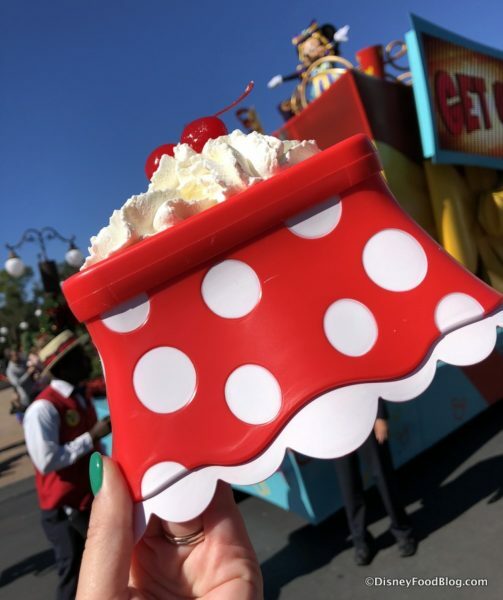 The Minnie Kitchen Sink Sundae features two scoops of your choice of ice cream topped with hot fudge, whipped cream, cherries, and your choice of peanut butter or caramel served in a Minnie Kitchen Sink souvenir bowl. 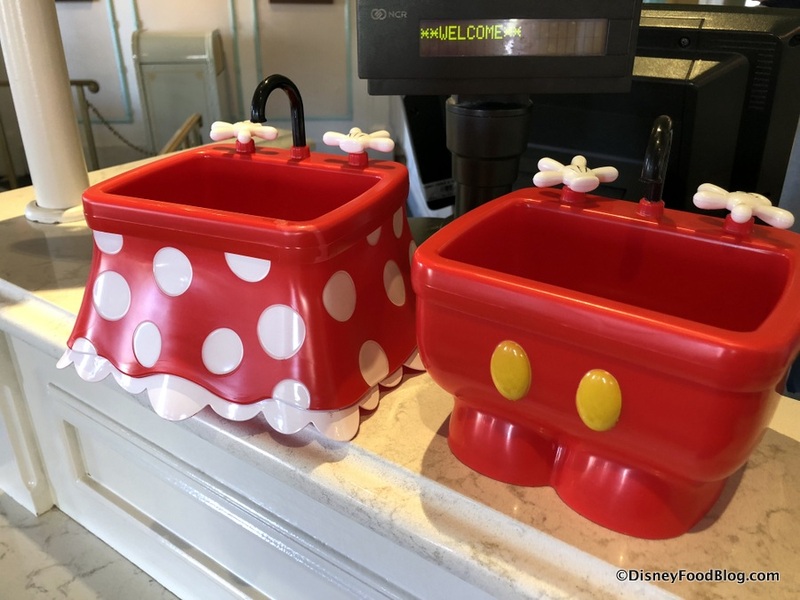 The Mickey Kitchen Sink is still available here, too! 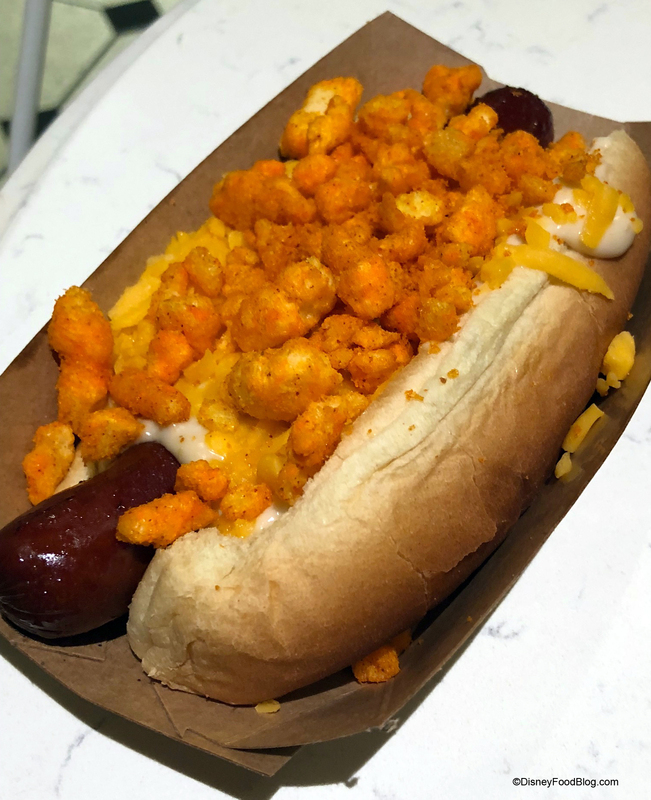 Cheese once again figures into our next item: it’s the limited-time return of the Cheesy Hot Diggity Dog at Casey’s Corner! 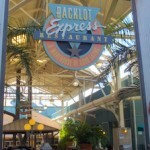 You can read our review when we tried it the first time here! 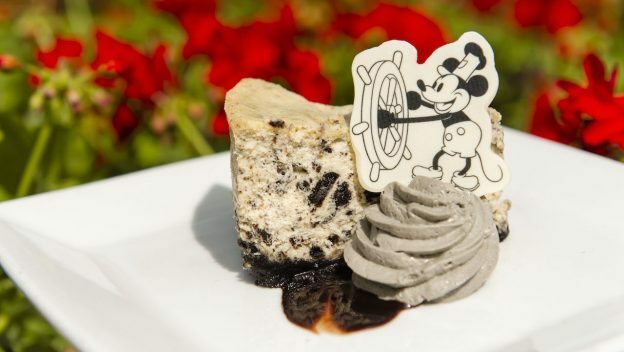 The Steamboat Willie Cookies and Cream Cheesecake is a specialty dessert you’ll only find at select Table Service restaurants in Magic Kingdom this weekend. 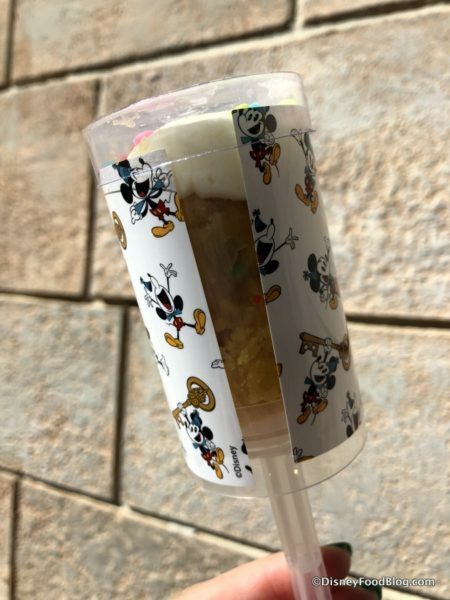 Order it at Jungle Navigation Co. LTD Skipper Canteen and Tony’s Town Square Restaurant, and find it at The Crystal Palace as well. 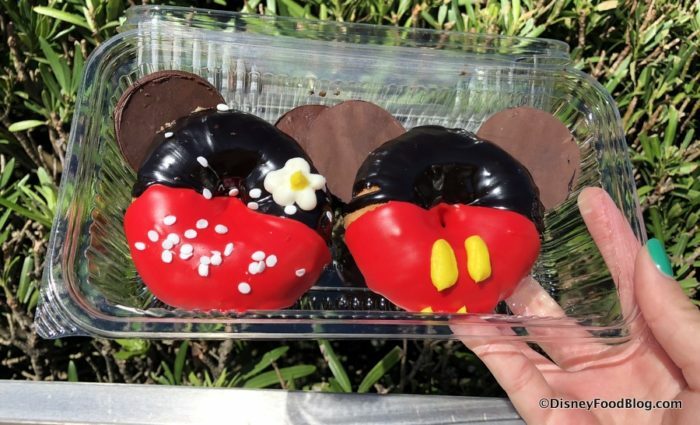 Mickey and Minnie Donuts offer a sweet start to the day…. 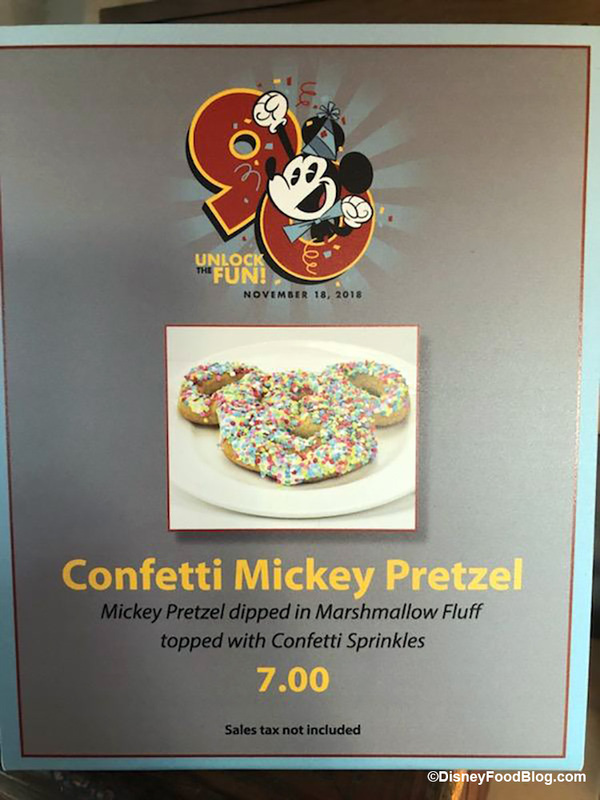 IF you can get them at rolling snack carts. These were selling out QUICKLY this morning, and we’re not sure how long they’ll be around moving forward. 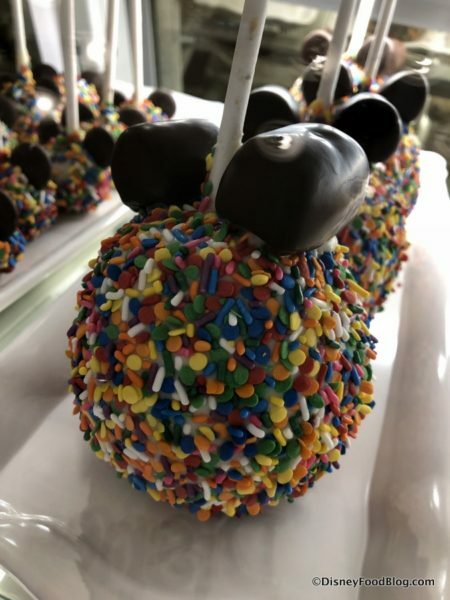 So snag ’em if you can spot ’em! 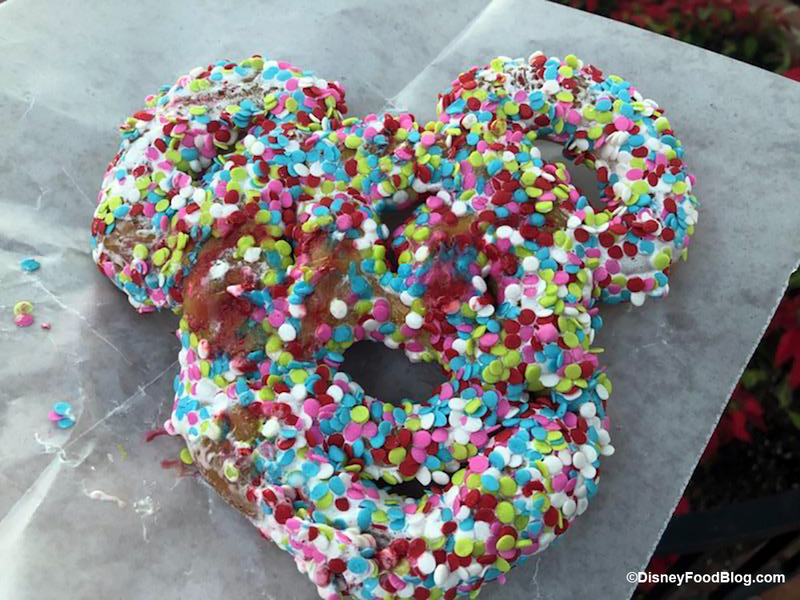 We love our Mickey Pretzels, and now they have an extremely festive makeover! 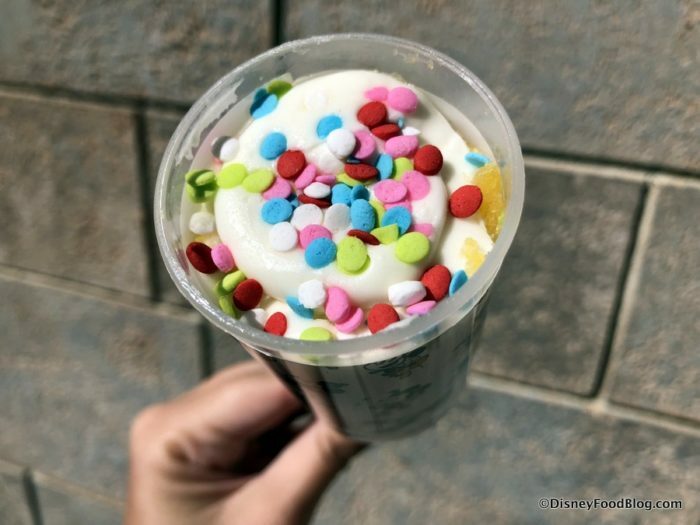 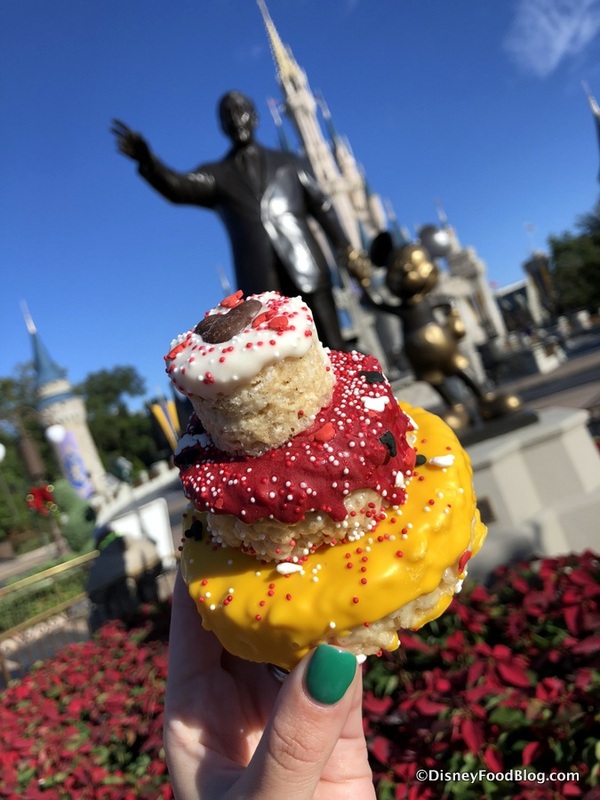 This is the classic Mickey Pretzel dipped in Marshmallow Fluff and Topped with fun Confetti Sprinkles! 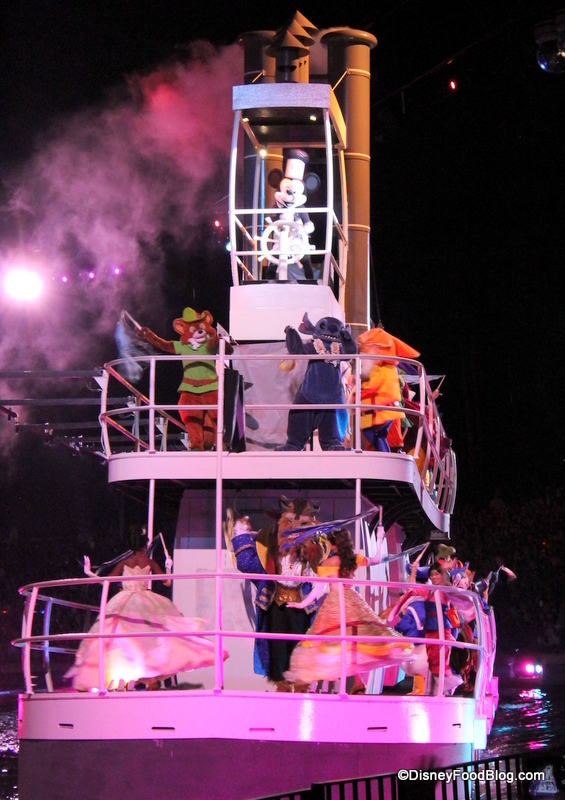 It looks as fun as it sounds! Keep an eye out for classic confections at spots like Main Street Confectionery and Big Top Treats to sport Mickey’s colors, birthday confetti, and join in the celebration! 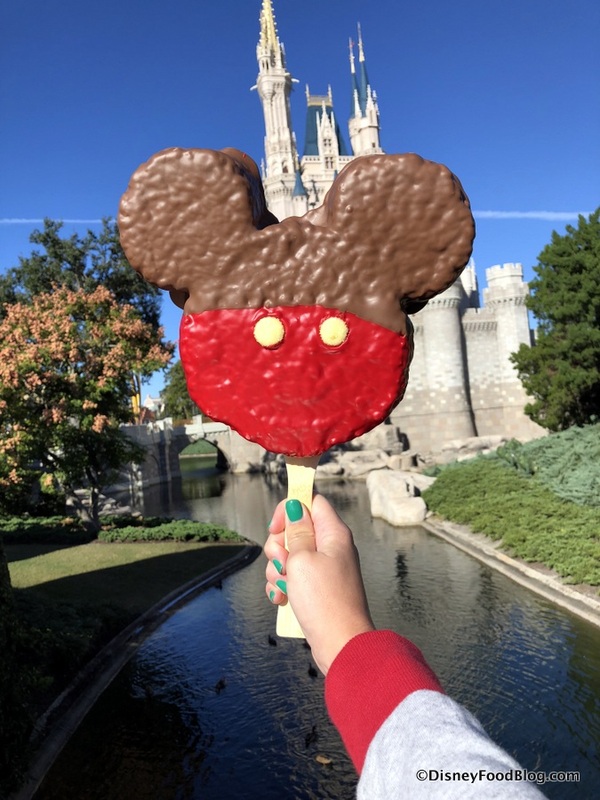 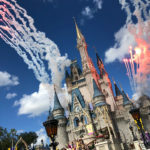 For instance… the WORLD’S LARGEST MICKEY-KRISPY-TREAT-ON-A-STICK is as big as Cinderella Castle! 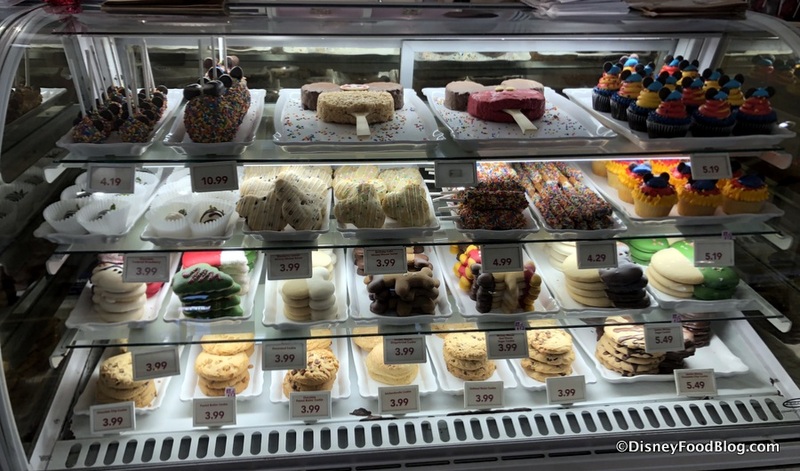 Okay, not exactly… but pretty close 😉 . 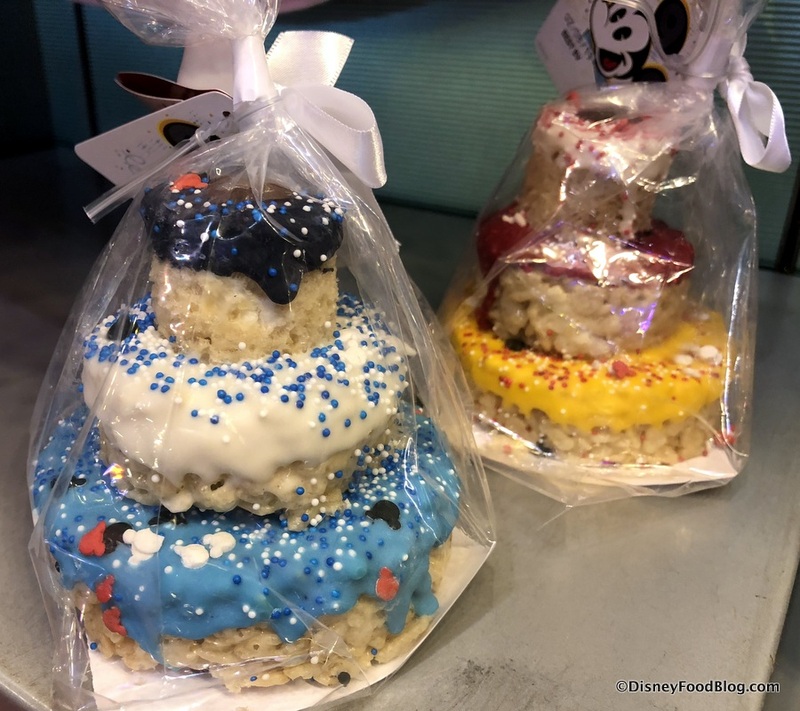 Check out the tiered Birthday Cake Krispy Treat! 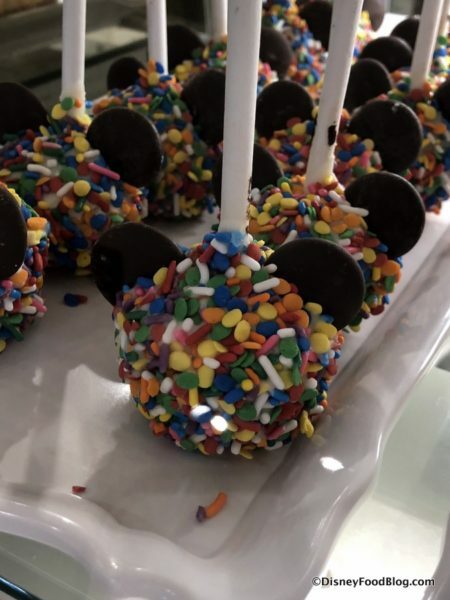 And don’t forget Birthday Confetti Caramel Apples and Cake Pops! 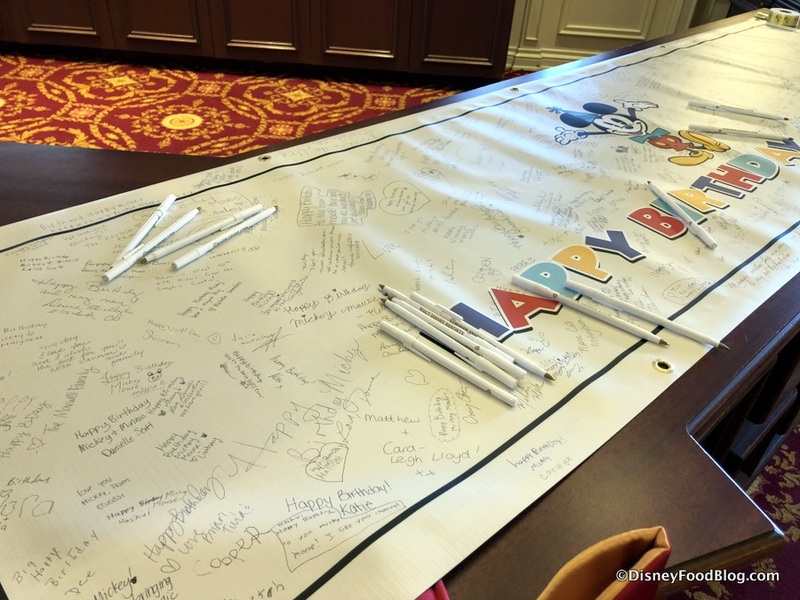 Don’t forget to stop by the Town Square Theater to sign Mickey’s Birthday Card! 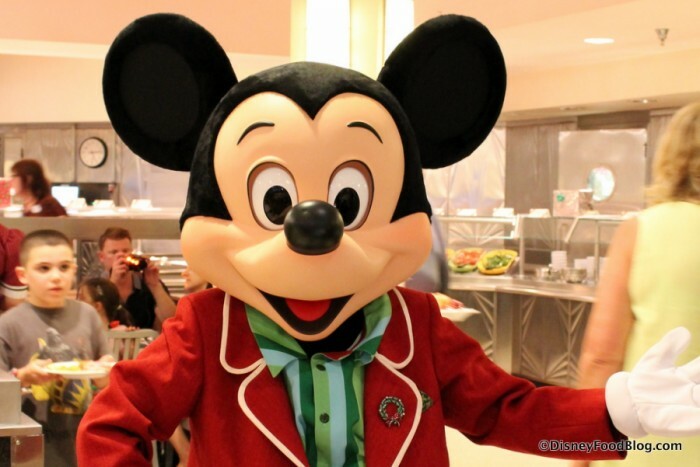 THANK YOU, Mickey, for 90 Magical Years! 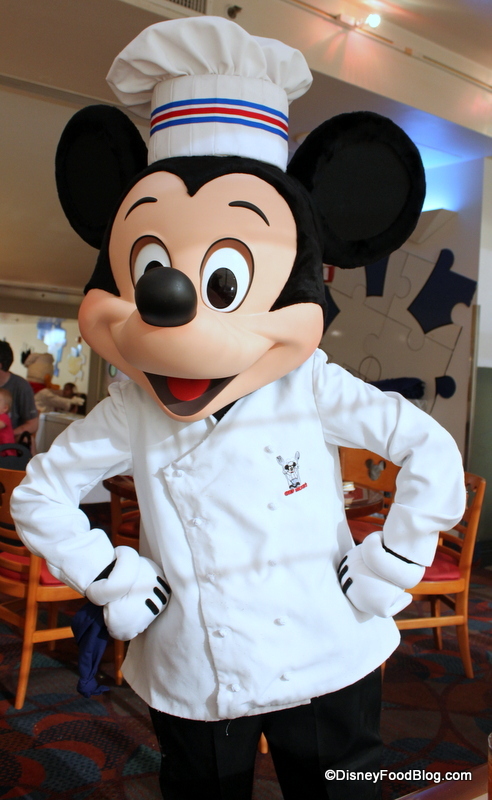 Feel free to wish MICKEY a HAPPY 90TH BIRTHDAY with a comment below!! 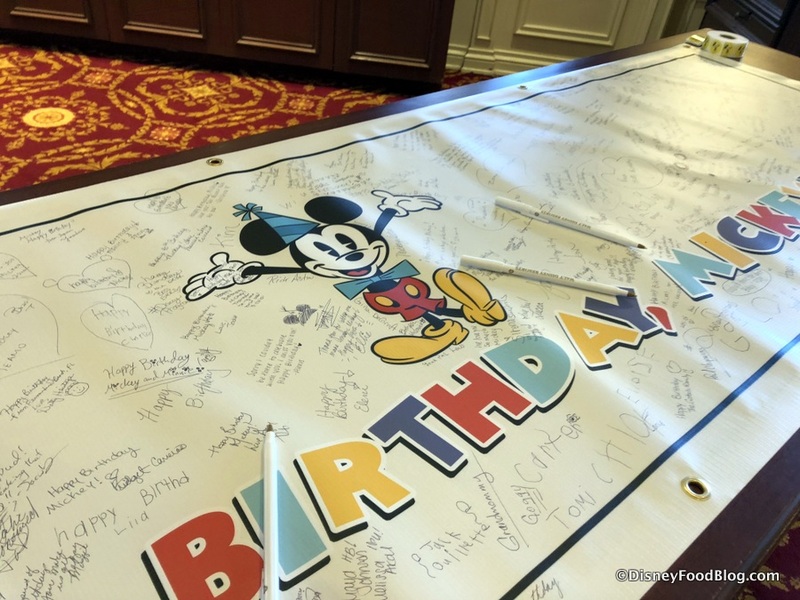 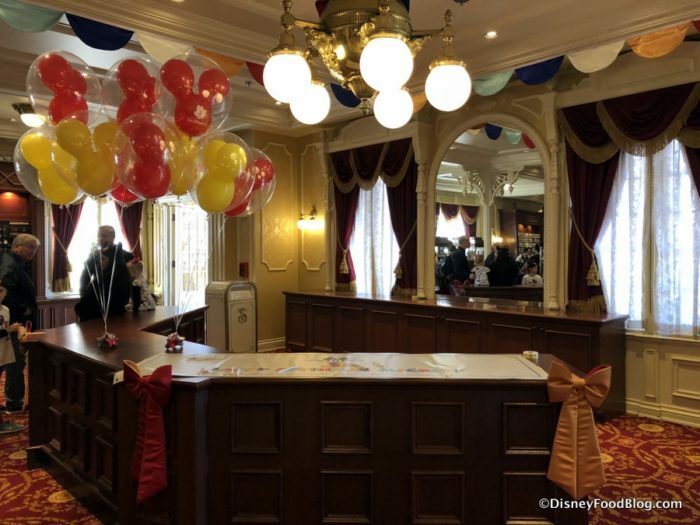 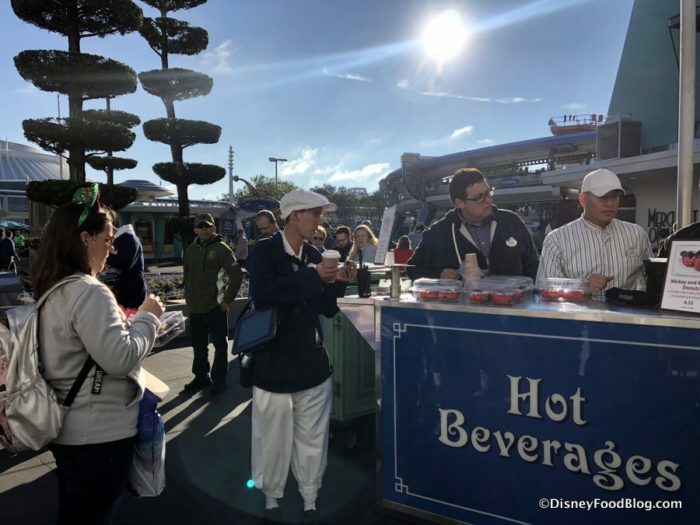 « LIVE From Mickey’s Birthday Party — Here’s the Must Have (And Selling Out FAST) Merchandise! Are any of these available as snack credits? 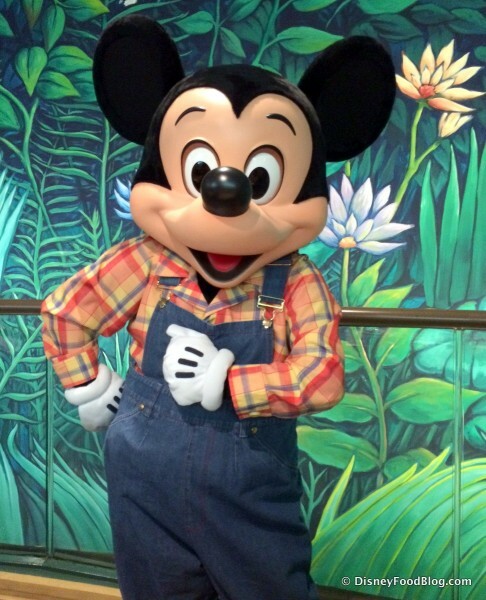 Happy birthday, to my best pal! 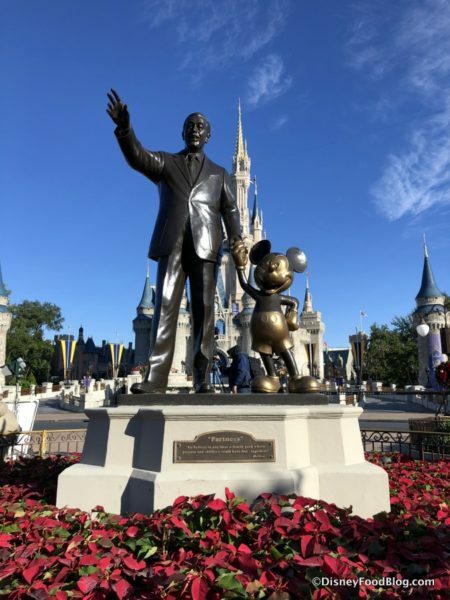 I’m so glad that you guys got to go and share photos with us! 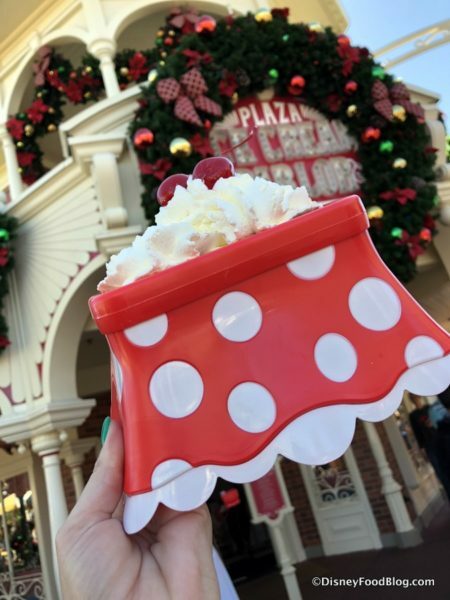 Are you actually going to review these items? 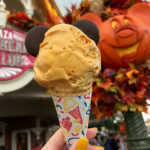 LB, reviews for many forthcoming! 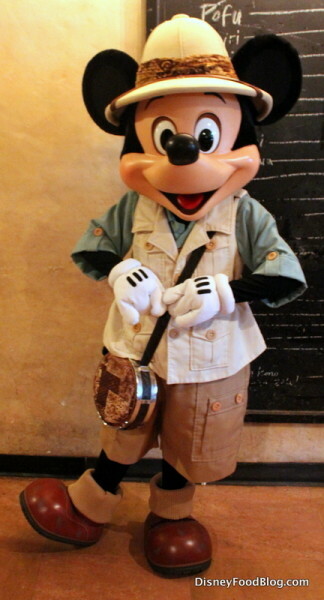 Happy Birthday, Mickey!!!! Can’t wait to visit you again !! 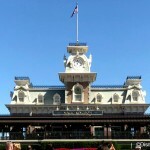 Mary, Disneyland opened on July 17, 1955, and Walt Disney World (Magic Kingdom) opened on October 1, 1971. 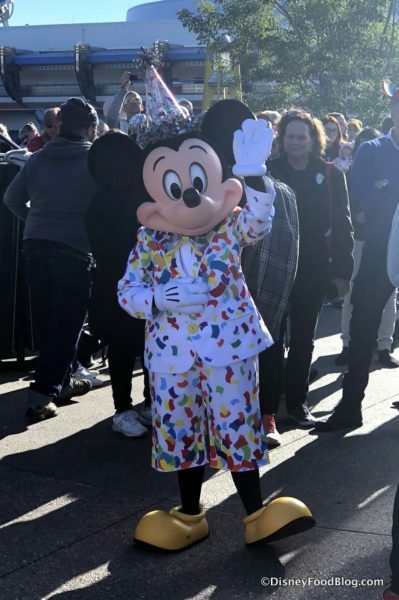 So depending on which park she visited and whether she went during the first year or not, the sweatshirt could be 63 years old (Disneyland) or 47 years old (Disney World). What a fantastic memory to bring back for her!